(5-18-17) Four candidates are seeking election to the National Alliance on Mental Illness national board on what they are calling a “Focus on Serious Mental Illness” platform. In their five minute candidate speeches, all four said they want NAMI to focus more of its attention on adults with serious mental illnesses, defined as schizophrenia, bipolar disorder, and severe and persistent depression (known as SMIs). D. J. Jaffe, author of the book Insane Consequences: How the Mental Health Industry Fails the Mentally Ill, and Mary Zdanowicz, who was executive director of the Treatment Advocacy Center for nine years, are perhaps the best known of the four hoping to change NAMI’s sixteen member board. I’ve felt tension before within NAMI’s ranks, but I was surprised recently when I was asked to substitute the term “mental health condition” for “mental illness” at a recent NAMI function and specifically asked to focus on “positive stories of recovery” rather than how individuals with SMIs are ending up in jails and prisons. I have never been asked before to do this and I was astonished because “mental illness” is part of NAMI’s name. Curious, I checked NAMI’s website and saw that the category “Mental Illnesses” had been replaced by “Mental Health Conditions,” which were identified as “ADHD, Borderline Personality Disorder, Anxiety Disorders, Dissociative Disorders, Eating Disorders, Obsessive Compulsive Disorders, Post Traumatic Stress Disorders,” along with schizophrenia, bipolar disorder, and depression. In the midst of all this, I was asked to help publicize a series of rallies being held on May 20th by a group called Families for the Treatment of Serious Mental Illnesses, whose organizers include NAMI members who said they felt abandoned. I was surprised at how widely that blog spread. In a telephone call, NAMI’s Executive Director Mary Giliberti, said she could not comment on specific candidates. She said NAMI has always and will always advocate for individuals with serious mental illnesses. Giliberti said NAMI uses both terms – mental illness and mental health conditions – interchangeably. She explained that NAMI has become a national leader in promoting states to implement First Episode Psychosis (FEP) programs because studies show that the earlier an individual is diagnosed and receives treatment, the better the chances of recovery. NAMI successfully advocated for the establishment of a ten percent set aside in federal mental health block grant programs specifically for FEP programs. NAMI’s top priority is preserving Medicaid, the largest provider of mental health care, Giliberti said, and that is especially important to persons with serious mental illnesses. She noted that NAMI has long advocated for repeal of the IMD exclusion that limits hospital beds and continues to support Assisted Outpatient Treatment as a last resort. Giliberti said NAMI has campaigned for Crisis Intervention Team training, criminal justice reforms, and more housing – all important for individuals with SMIs. Its chief lobbyist has lobbied for funding for McKinney Vento Homeless Assistance Act, which no other mental health group has done. In addition, NAMI has lead efforts to the end the death penalty for those with SMIs as well fighting to end the use of solitary confinement for SMI prisoners. NAMI’s actions in these areas demonstrate its strong commitment to individuals with SMIs. Reaching out to others with non-SMI diagnoses gives NAMI a greater voice and more impact on Capitol Hill, Giliberti said. Despite these many accomplishments, critics such as Jaffe say NAMI is spreading itself too thin and consciously ignoring the unpleasant side of mental illness. In 2009, a passionate debate was held at NAMI national about what cover to use on its Grading the States Report. Some argued that showing a homeless woman did not send a recovery oriented message. That argument lost, but it revealed what some see as a ongoing tension about NAMI’s focus. NAMI was founded in 1977 by Harriet Shetler and Beverly Young, two mothers who felt families were too often blamed for their children’s mental illnesses, especially the so-called “schizophrenic” mother. The organization struggled, but began to gain members and chapters after Dr. E. Fuller Torrey, the author of the now classic book, Surviving Schizophrenia, personally began traveling to communities to help organize chapters. He did this without pay and donated profits from book sales to NAMI. As NAMI grew there were debates within NAMI about whether “consumers” could become members. NAMI chose to welcome them. This growth corresponded with greater acceptance of the “recovery movement” that challenged the traditional “medical model” approach. Studies began to suggest that trauma could cause mental illnesses, especially PTSD. In 1998, NAMI and Dr. Torrey, who had done so much for the organization, parted ways. One reason was because he criticized some recovery recommended programs that he said were based on “junk science” and designed for the “worried well” rather than those with SMIs. At one point, several board members threatened to boycott their own convention if Dr. Torrey was invited to speak. Clearly, NAMI was changing. Dr. Torrey, along with current NAMI board candidates, Jaffe and Zdanowicz, founded the Treatment Advocacy Center, that initially focused on passing Assisted Outpatient Treatment laws – a hot button with many consumers in the recovery movement who consider AOT coercive. TAC also went against the grain in arguing and publishing reports that said individuals who are untreated and have SMIs are more prone to violence. The federal government through the Substance Abuse and Mental Health Services Administration (SAMSHA), which doles out $3.5 billion in federal funds to states, became a frequent Torrey and TAC target, especially after Torrey revealed that the organization didn’t have a single psychiatrist on staff nor did it have any idea how many Americans had schizophrenia. Its former chief medical officer revealed that many of its administrators didn’t believe SMIs were real, but rather that mental illnesses were alternative ways of thinking. After the Newtown elementary school shootings, Pennsylvania Republican Tim Murphy accused SAMHSA of promoting an anti-psychiatry philosophy and shepherded his Helping Families In Mental Health Crisis Act through Congress into law. Among those advising Murphy were Dr. Torrey and board candidate Jaffe who lobbied heavily for its passage. One of the new law’s intentions is to force SAMHSA to focus on SMIs, evidence based practices and science rather than recovery movement “feel good” programs. Now Jaffe and his three fellow board candidates on the SMI platform have turned their sights on NAMI’s board which they claim has swung too far away its historic purpose of focusing on SMIs. This debate is not new. Through the years, NAMI members have swayed back and forth arguing for or against the medical and recovery models. As a parent, I have come to believe that medication alone is not enough, especially because studies show that medications don’t help everyone. Yet, it is medication that keeps my son stable. I have become a strong proponent of Housing First, of ACT teams, of Fountain House, of jobs program, of solving transportation needs for those who are sick, of clubhouses and of giving individuals hope. I believe that we must believe in recovery even though we recognize that some will not recover — because we are poor judges of who will and who won’t get better. I also believe there are times when we minimize the seriousness of these illnesses. Some 5,000 individuals with SMIs die each year and whether you call that “committing suicide” or “choosing to end their own lives,” the tragic outcome for families is the same. People with SMIs do “suffer” regardless of how we try to happy face these illnesses and requiring health workers to write that an “individual has chosen not to take medication” versus writing they are “non compliant” might help “empower” and “respect” them but sadly doesn’t mitigate the cruelty of an SMI. 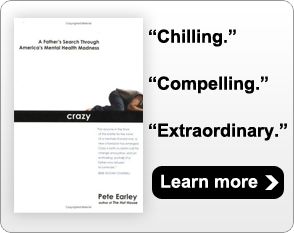 I believe there are times when parents must intervene, as I have, which is why I have written about the foolishness of involuntary commitment laws that require waiting until someone is dangerous. My son has been involuntarily committed. However, coercion often splinters family relationships and that has lead me to believe the true key to my son’s recovery was his acceptance of his illness and his willingness to engage and take control of his own treatment. He is a peer. The question is how do we help people engage in their own recovery and is it possible that everyone can engage given the severity of mental disorders such as schizophrenia? Those same uncomfortable questions can be asked about whether it is truly possible for everyone with an SMI to live in a community setting. The answer, I suspect, depends too often on what worked for you and your family when all individuals are different. It has been unfair of me to focus in this blog only on the four candidates who are trying to make, as Jaffe wrote, “NAMI refocus on SMIs” and the lone Virginia candidate, while ignoring the others seeking election. For this I apologize. I would urge you to visit all of the candidate pages and listen to their speeches. But with four candidates campaigning on a “Focus on Serious Mental Illness” ticket, I think it is fair for NAMI members, including me, to ask ourselves questions about NAMI and its future. Has NAMI lost its way or is it spreading its wings? Who should NAMI represent? The DSM-5 lists nearly 300 disorders, including sleep apeana and restless leg syndrome. But should NAMI only help those with SMIs? Should NAMI focus more on recovery, hope and positive stories? Or should it continue sounding alarms about how badly our system treats the sickest of the sick. Or both. These are important questions because NAMI is important to all of us who have a loved one who is sick whether you call it a mental illness or mental health condition. Here are your board candidates who will help determine NAMI’s direction. Votes will be officially cast on Friday, June 30th, at NAMI’s national convention in Washington D.C. but the real voting is taking place now as chapters decide who they should back. Individual NAMI members can not cast ballots at the convention. Rather, they are supposed to let their local NAMI affiliate know who are their favorite candidates. The affiliates then send a certified representative to the convention to cast ballots. The day before the vote – Thursday, June 29th, — convention attendees will be able to pose questions to the current board during an open mic session held between 3 p.m. until 4:30 p.m.